Great fall day - low 50s, no precip. WGR550 – they’re figuring out how the Bills can make the playoffs! Yamasa line debuted at the 2016 IPCPR Convention. The line of cigars is directly inspired by the Yamasa region located in central Dominican Republic – about 20 miles north of Santo Domingo. The region itself is not a traditional tobacco-growing area but Davidoff has been growing there for 20 years. 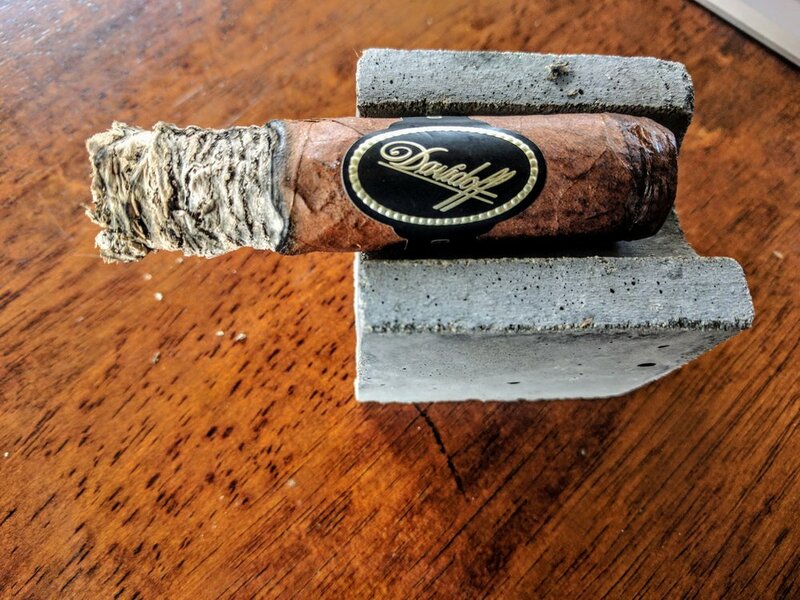 Something pretty amazing – I guess Davidoff worked hand-in-hand with local scientists based on a hunch that the pH level of the soil (largely sand and loam) needed to be raised in order to effectively grow tobacco plants. So they went plant-by-plant to determine the necessary increase and customized a blend of calcium and nitrates for each tobacco plant. They narrowed down the potential seed options to 3 (from over 30!) and used only the best 21 (out of 100) hectares of land – all of this was based on Henke Kelner’s gut feeling. I mean, I’d trust that guy! Finally, to help with storage Davidoff built some climate-controlled facilities for the leaves to get hung and dried. Here’s the official Davidoff brochure – interesting that they recommend a pairing of single-malt whiskey. I find that a little funny given the diversity of single-malts out there! The Davidoff white label is a classic - so I'm glad they didn't try to rebrand the line too much. I know they now have the black label line of smokes and I feel it's a perfect departure from the others. The matte black is emphasized by the soft gold of the lettering and dots. Paired with the Hershey's chocolate color of the stick, it really stands out as a polished, luxurious look. The stately red "Yamasa" label compliments it simply and doesn't detract from the feel. 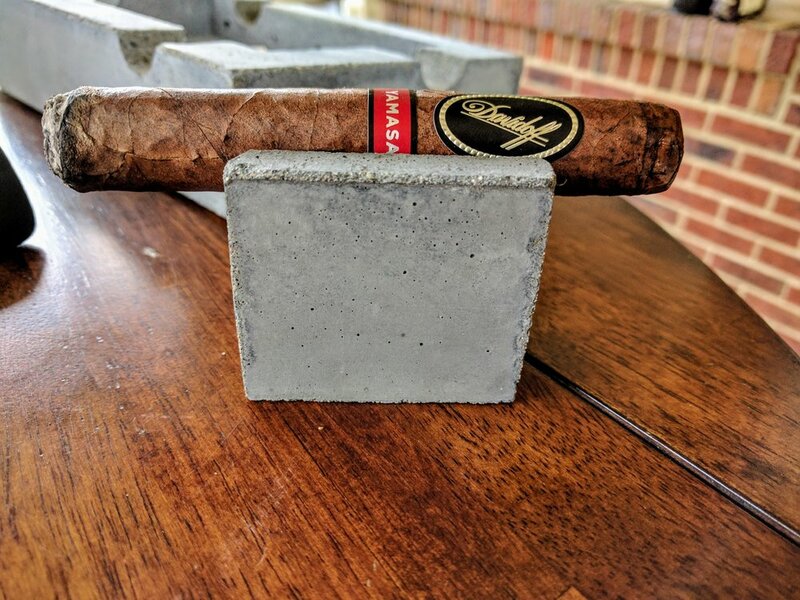 The Davidoff Yamasa is a very nicely constructed cigar. Everything from the band to the coloration oozes luxury smoke. Although there is noticeable veining on the body, it is exceptionally smooth and free of any bumps or raised areas. A light inspection of the body did not reveal any soft spots. 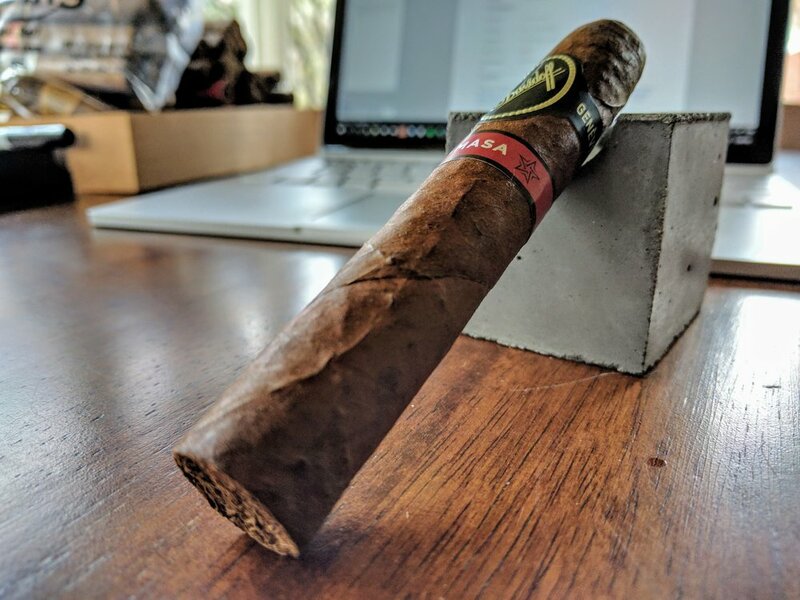 This cigar feels just about perfect – there’s a minimal amount give. It’s uniformly firm to where you’re just able to pinch it a little. The wrapper is a uniform horse hide, Hershey bar brown. The cap is expertly made and feels very solid. The foot looks packed tightly without being overloaded – some slight color variation from very dark brown to a light, sandy tan. 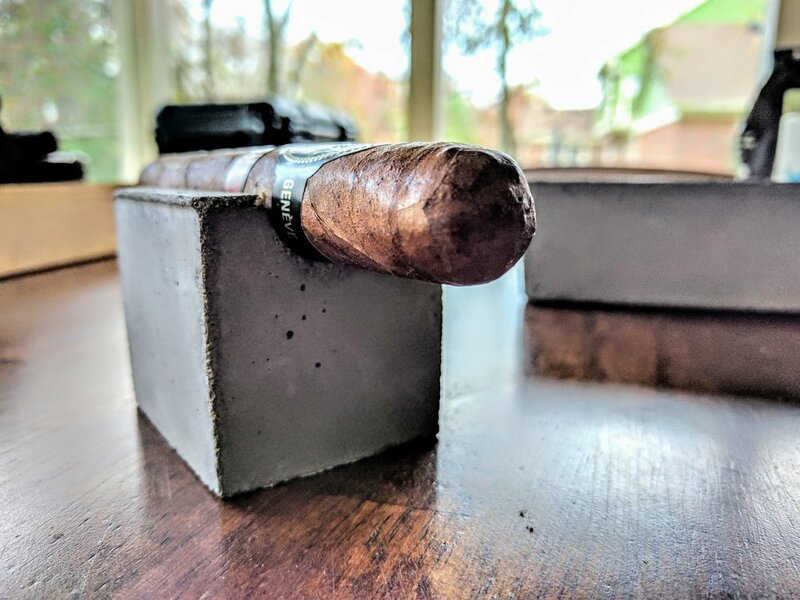 A deep, rich old tobacco smell mixed with some light barnyard and leather notes. Absolutely perfect. There’s a moderate amount of air flowing on the cold draw that brings flavors of pine/cedar and a very subtle sweetness to it – chocolate/cocoa maybe. A quick slice and toast and it lights up effortlessly. Lit with matches today – just felt right. Perfect draw continues and I’m immediately hit with a sweet, brininess – sorta like an oyster – but tamed way down. At light, plenty of smoke. A couple minutes in, it’s a very delicate trail of steady smoke that often is not readily visible. 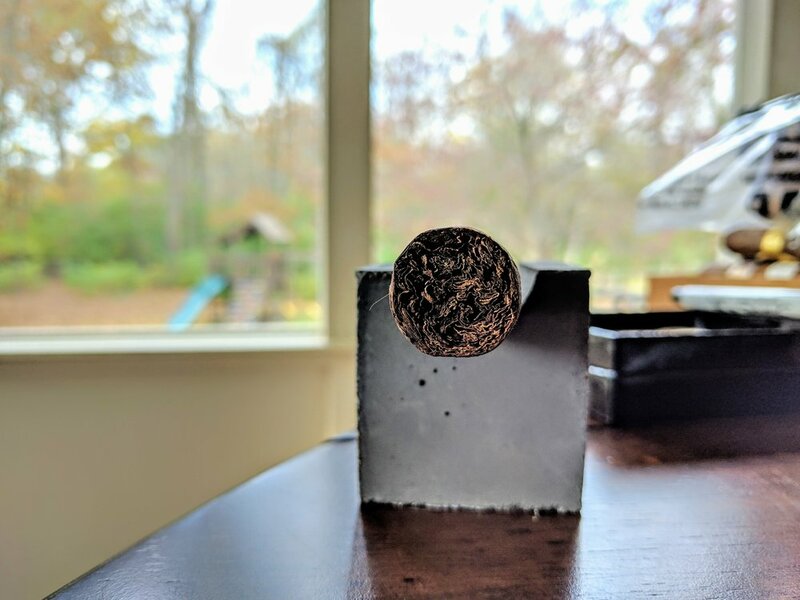 Smoke from the body of the cigar is a very light brown/grey color throughout the experience. 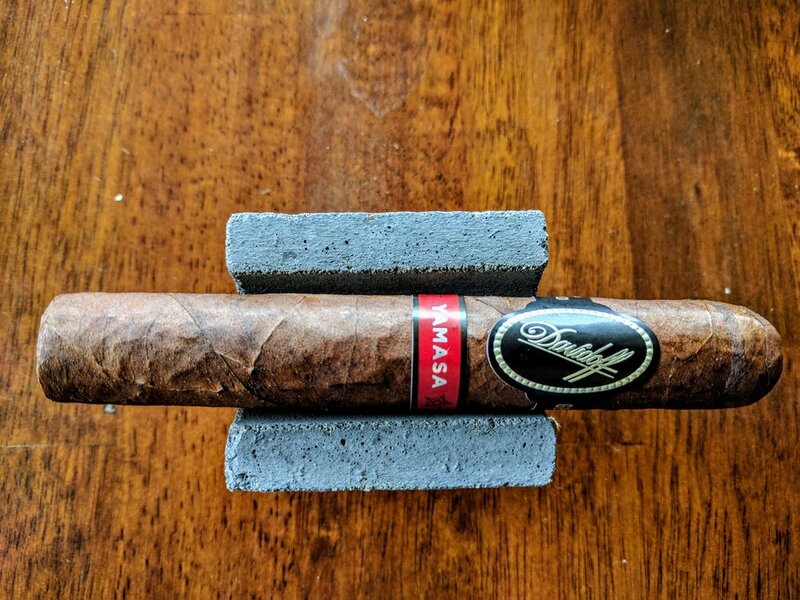 This is a cigar that builds flavors subtly and superbly. Each puff so far starts with a salty little bit of brine and seamlessly transitions to a deep, rich sweet finish. 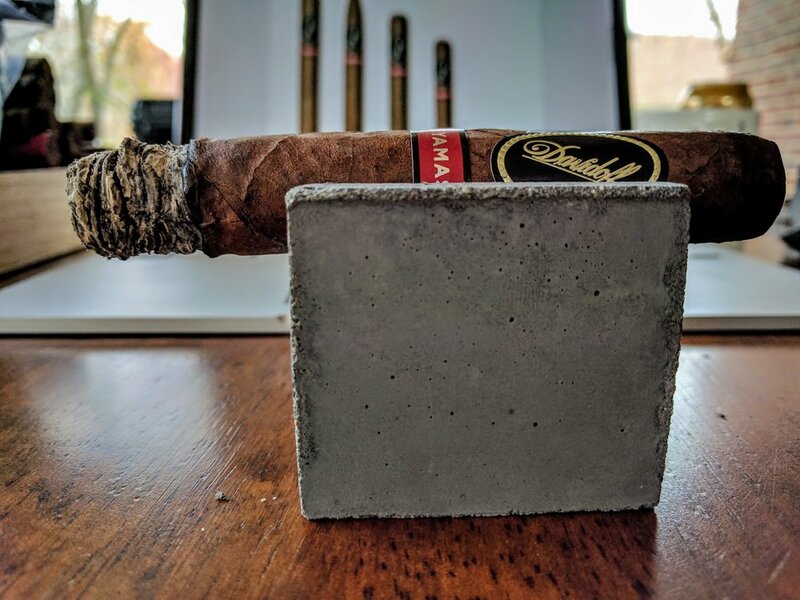 Burning pretty well so far, except the burn line is slightly wavering – something I’d rather not get from a cigar of this caliber but maybe it will work itself out. 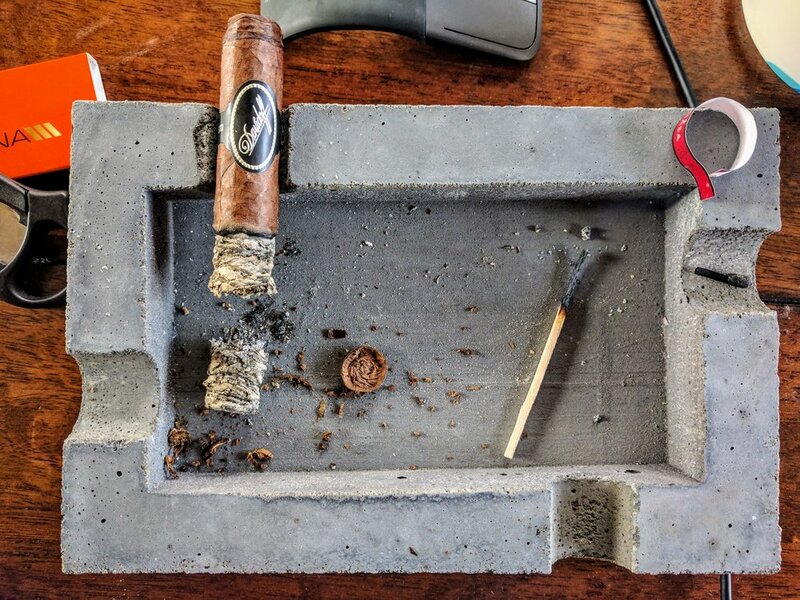 The sweetness of the cigar seems to be waning for more of an earthy, meaty flavor with some briny pepper. As I progressed toward the middle of the middle third (I guess the half way point of the stick), a creamy sweetness returned – warmed vanilla milk after-taste. Might just be me but I get some chalkiness as well. 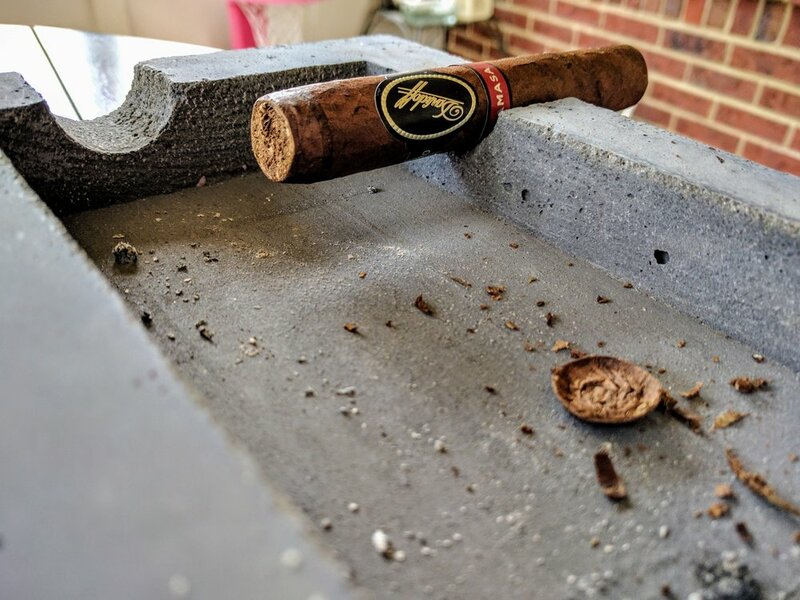 Cigar ashed very consistently – always about the same length of ash before promptly falling off right as I took a pic to try and show the ash! Final third is a continuation of the earthy, peppered meat feel and moves to a drier wood profile. Strength has certainly picked up as the stick progressed. I had to relight one time as I got into the final third. The burn line has remained consistently, minutely wavy – nothing major just not the razor’s edge you might expect. The Yamasa truly shines as Henke’s pet-project. The care and love put into this smoke is very apparent – from the flavor profiles to the superb construction. As far a high-end luxury smokes go, this one hits most of the right notes. It’s complexity, however, is so subtle that if you’re just casually smoking it, you very well may miss it. I’m sure there’s aspects I overlooked or couldn’t taste and that was while I was concentrating on detecting all those things! 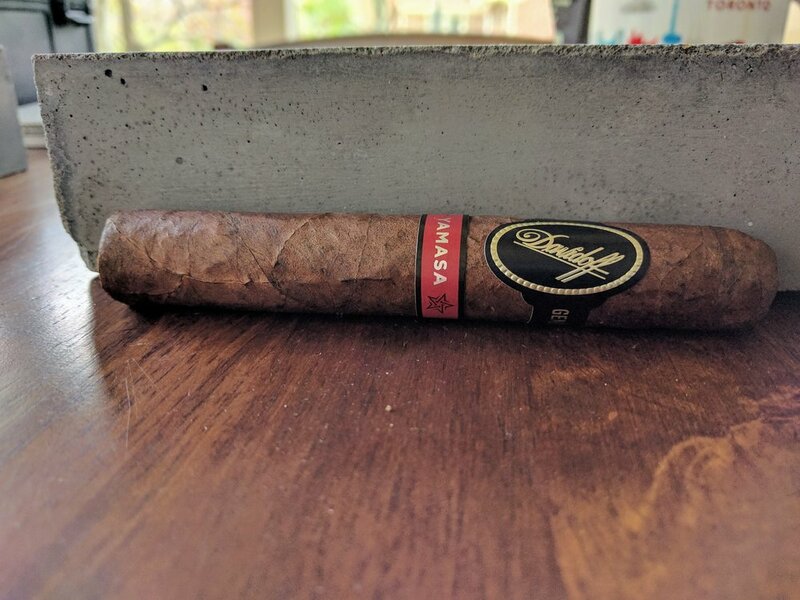 All in all, it’s a fantastic cigar that I’d smoke again But at $19, it's more of a special occasion smoke than everyday!